Being one of the major robot manufacturers, Kuka Roboter GmbH certainly is the number one supplier of Absolute Accurate Robots. 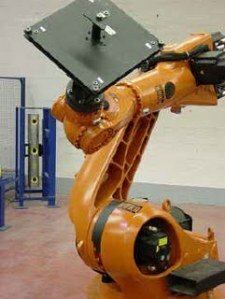 This is mainly due to the wide acceptance of these calibrated Kuka robots at BMW and DaimlerChrysler. An absolute accurate robot is based on the standard robot, but is individually measured in a high number of poses. The deviations and errors that come out of these measurements are used to build a robot signature. This robot signature is different for each of the robots and predicts all geometrical and flexibility errors in the entire working range. The signature will be used inside the robot controller to make it “absolute accurate”, independent from position or active payload. Absolute accuracy is one of the necessary steps to limit the difference between the off line simulations and the real production line.